Ad materials that satisfy Yandex's requirements and the laws of the Russian Federation must be submitted for moderation no later than two working days before impressions launch. However, we recommend that banners be submitted no less than five working days before impressions start. This will help you avoid unplanned delays resulting from having to make changes to banners. The added banners should correspond to the formats chosen in the line settings. If a chosen format is absent or doesn't pass moderation, the line impressions don't start. On the campaign page, go to the Banners tab. The list of available banner types is generated dynamically in accordance with your line settings. In the window that appears, select Banner type. Add your own elements or use a pre-made set of buttons. Change the size, position and transparency level of elements. Enter links (so the user can click on that element to get to your page). Edit the time when an element will display. After you click Save, you can view the banner in the preview window. All banners are enabled by default. When you add a banner, you need to set a schedule for it. In other words, you need to indicate what sites your banner will display on and according to what principle. Check the boxes for the appropriate banners. Select Link to flight in the menu that appears. In the Link field, only the schedules for lines with suitable banner sizes are shown. Check the boxes for the appropriate schedules and click OK.
On the campaign page, go to the Banners → Targeting tab. 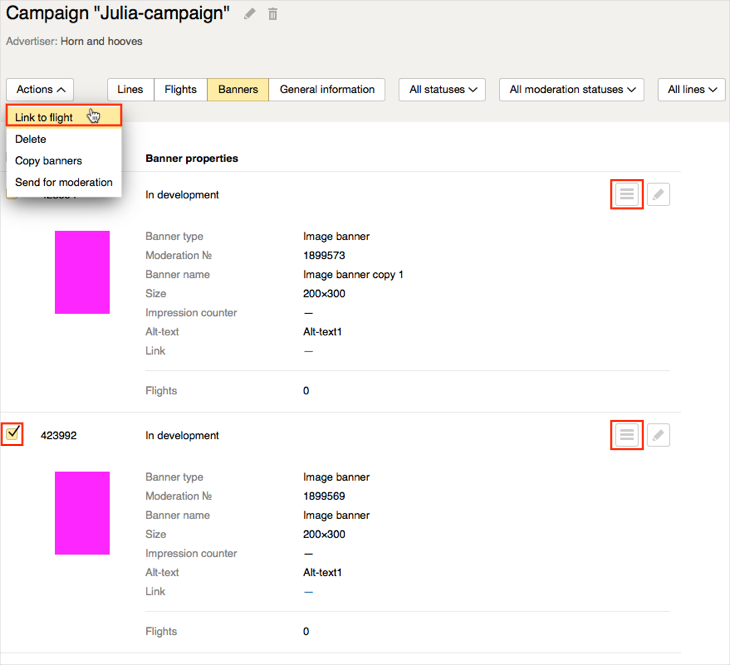 At present, “Yandex.Audience segments” targeting works for banners. You can read more about configuring this type of targeting in the Yandex.Audience segments section. In the menu that appears, select Send for moderation. The status for banners that you send will change to “Waiting for moderation”. The status of banners that are accepted by the moderators will change to “Accepted by moderation”; those that are rejected — to “Rejected by moderation”. You will get an email when your banner status changes.